Providing evidence of the investigative potential of dreams. Assembling the science of information download from a network/cloud consciousness. Home of the red grid mark phenomenon investigation. 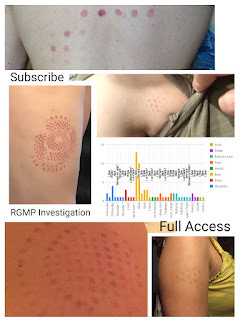 In a concerted effort to keep this ball rolling and formally reopen the RGMP Investigation, I am going to be offering a Member Subscription to new RGMP content. Years of struggling how to make this research self-sufficient has led me here. I want to provide my continual readership with quality reporting, exciting truth, and timely interaction with a regular stream of content. To do so, I must move forward in the digital marketing world as so many other journalists and news reporting outlets have done by limiting access to the content we work so hard to obtain. Subscription is $5/mo. for full access to RGMP articles, reports, & analyses. Content is fully aware of the cause and discusses it freely in relation to new information. I cannot compare myself to the NY Times in scope, business acumen, and quality of resources, being a small independent research team of volunteers at this point, but I can take a tip from their book, and model myself after other moderately successful researchers in the field, like Linda Moulton Howe of Earthfiles.com. Her decades of investigative research has long been an influence for me in this process. Here I am, having stumbled into an unusual phenomenon, with the general (working) know how and setup to do it some good. Maybe a sense of duty pervades my return. Whatever it is, I want to do it justice. Dreaming and consciousness exploration of my own experimentation will continue to be free. Reports on case studies of their own altered states experiences, as well as any divulging content on the RGMP relative to the Dossier's information will be available to subscribers only. Subscribe for full access to all RGMP published releases. After nearly four years of investigation, the RGMP Research Team has finally released this compilation on the red grid mark phenomenon. Featuring exclusive content, such as photo selections, statistical analyses of survey data, and long-awaited conclusions on the cause of the grid marks, this dossier is meant to provide all the relevant information experiencers and curious readers would want in one organized, and clear ebook style work. Although we are no longer investigating grid mark occurrences, you can still report yours by filling out our General Info Survey. Include any relevant information you feel comfortable providing. Anonymity will be upheld unless otherwise indicated. Thank you for your help in tracking and investigating this phenomenon. It was the willingness of experiencers like you to report that allowed us to finally provide a theory on its source. Lucid Dreamer Jennifer investigates the relationship between consciousness and the zero-point energy field, the Red Grid Mark Phenomenon (RGMP), communicating with alien presences, understanding advanced technology, Earth changes, telepathy, and synchronicity. Her primary research is in mapping the dreamscape. She has encountered dozens of non-terrestrial species in her dream walking, and considers herself an advocate for integration. Paranormal experiencer and dream investigator Jordon met Jennifer after a strange grid pattern appeared on his back in 2012. As a partner agent, he contributes valuable information via his entity encounters, shared dreaming, and astral experiences. He seeks to understand the multifaceted nature of these experiences and the way they relate to our evolution and daily lives. Out-of-body experiencer, and ex-ghost hunter, Brian finally found his way onto the RGMP Investigation Team after a recurrence of the grid marks prompted him to resume his decades long search into the phenomenon. He is an incredible optimist with a positive and uplifting outlook that offers a welcome balance to our group. He provides immediate responses to incoming cases, and serves as a caseworker and intermittent author to the site. Jennifer B. 2015. Powered by Blogger.